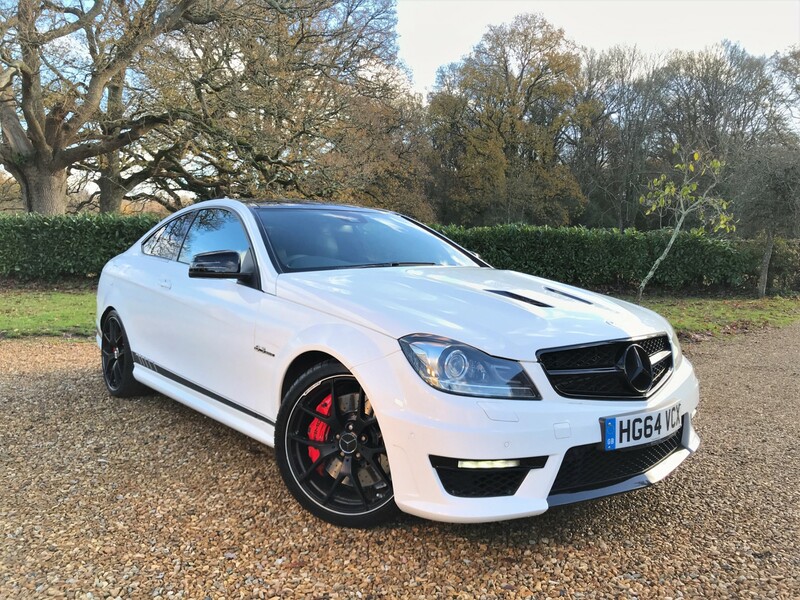 We are delighted to offer this stunning, high spec, 2 owner example with FMBSH and comes with a no advisory MOT to November 2019 and a fresh service, it benefits from a recent set of Michelin Pilot Sport 4S tyres, key specification includes pano sunroof, COMAND with heated seats, LSD and park camera White, previously supplied by ourselves in 2017 the most recent lady owner had covered a mere 7k miles in this time and had the premium matching Michelin Pilot Sport 4 S tyres fitted at a cost of £900+, serviced a total of 6 times, 5 of which by its supplying dealer Mercedes-Benz of Salisbury and most recently in November 2018 just 20 miles ago using Genuine Mercedes-Benz parts. It’s rare and desirable specification makes it one of the most affordable 507 edition coupes available on the market, finance options are available through our partners MotoNovo and part exchange and nationwide delivery are welcome, the raucous V8 engine provides an exquisite noise when provoked and provides an instantaneous surge of power throughout the whole rev range which never fails to put a smile on your face, servicing has been carried out the sole supplying dealer, Mercedes-Benz of Salisbury from new and will be serviced and MOT’d prior to sale for the buyers benefit, the brakes when required bring you to a standstill with ease and inspire confidence, there are 2 genuine Mercedes-Benz key fobs, one being an Affalterbach AMG branded key, our example operates without fault and is a fine example. Sorry we do not accept offers, viewings are available by appointment 7 days a week until late, accepted methods of payment are cash or a cleared bank transfer, you are able to reserve this C63 from as little as £100 before arranging an appointment to view, we offer nationwide delivery and part exchange, please request a HD YouTube video before enquiring for further details and read our excellent 80+ five star reviews or visit and follow us on Facebook and Instagram, 2 owners, buy from the best, we were ranked 92nd from 13,000 retailers at the recent Autotrader Awards 2018.